How much does it cost to travel to Puerto Vallarta? How much money will you need in Puerto Vallarta? 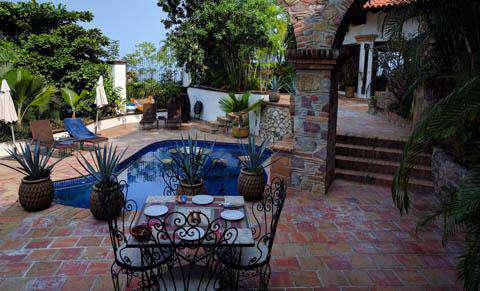 M$658 ($35) is the average daily price for traveling in Puerto Vallarta. The average price of food for one day is M$164 ($8.75). The average price of a hotel for a couple is M$833 ($44). Additional pricing is in the table below. These average travel prices have been collected from other travelers to help you plan your own travel budget. How expensive is Puerto Vallarta? Puerto Vallarta remains a popular tourist destination with Americans, particularly during spring break when students flock to the area. The area is quite beautiful and has many gorgeous beaches, interesting jungles and waterfalls nearby, and no shortage of luxury resorts and four star restaurants. Many of the locals speak English and are friendly and open to helping tourists with directions or general information. Puerto Vallarta's popularity means that its prices are some of the highest in Mexico, particularly during holidays when the area can get quite crowded. Puerto Vallarta's climate is tropical wet and dry. There is a rainy season from the middle of June through the middle of October, with the highest concentration of rain between July and September. The dry season is during the winter months with minimal cloud cover during February, March, and April. Hurricanes are rare but can occasionally hit Puerto Vallarta. Most people come to Puerto Vallarta for the scenery. The beaches are beautiful, as is the surrounding area. Banderas Bay is one of the largest and deepest bays in the world, and there are view points from many of the surrounding hills. There are beaches in many different areas, each with its own atmosphere and some more remote than others. There are many specific neighborhoods in Puerto Vallarto. One of the most notable is Centro, which is the oldest part of the city. This area's center is found north of the Cuale River. Emiliano Zapata is south of the Cual and is usually referred to as "Old Town" in most of the tourist information. The city's largest fish market is in Lazaro Cardenas. The city has recently renovated the boardwalk, which runs from just south of the old town to the middle of the downtown area. It's lined with plenty of shops, restaurants and hotels and you will find street performers entertaining the crowds as well. Outside of town, to the north, there are stretches of beach with golden sand. The area also has papaya and mango plantations and small villages. To the south of town there is lush, green vegetation and hills that fall into the bay. This area also has many small fishing villages, some of which are only accessible with a boat. To the east of town are the Sierra Madre Mountains and to the west is the Bay of Banderas. Most people head to Puerto Vallarta to relax on the beach, and for this purpose it will not disappoint. For those hoping for a more adventurous vacation, there are plenty of options as well. There are some great beaches for surfing, and scuba diving and snorkeling is a favorite activity for many. You can also head out of town and enjoy a zip line ride as well as a canopy tour through the jungle. Whale watching is also a favorite activity between December in March when you are most likely to spot whales. There are also many places around town to play golf, try your hand at parasailing and enjoy some horseback riding. There is an abundance of food options available around town. For casual meals and for the budget conscious, there are plenty of taco stands. There are also some wonderful rooftop restaurants that offer excellent views of the water, but also come at a higher price. You'll find plenty of beach side restaurants, some are a better quality than others, but in general the seafood is quite delicious and not to be missed. Taxis are a common way to travel around Puerto Vallarta. Prices are set and you can find a list of current rates at your hotel. You'll find a concentration of taxis around the intersection by the liquor outlet in the Centro District. Hotels and travel agencies also offer pickups from the airport, but prices can be high. There are two types of taxis at the airport. The white federal taxis are available as you exit the airport, but these are expensive. If you cross the pedestrian bridge over the highway you can pick up a cheaper yellow taxi. Buses are an easy way to get around town. Bus stops are common and you usually have to wait only a few minutes. The buses can be hot and crowded but only cost about US$.50.